The Chronicles of Ruthie Hart: Mama, airplane! I may be biased but Ford is just super cute and fun these days. He is so vocal and physical, learning tons of new words a day and exploring his abilities as a little boy. He still plays it pretty safe but has been really enjoying spending most of our days outside now that the weather is nice. His recent obsession is airplanes and anytime he hears one in the sky he says "MAMA! Airplane!" and covers one ear (he actually does this when he hears lots of noises- mowers outside, cars driving by, etc.). And airplane sounds like "pair pain". He flaps around so excited and waves hi and by to the planes. Last weekend the weather was beautiful and we were grilling burgers on the deck and he had a blast jumping on our outdoor sofa and waving to the airplanes. He just cracks me up! 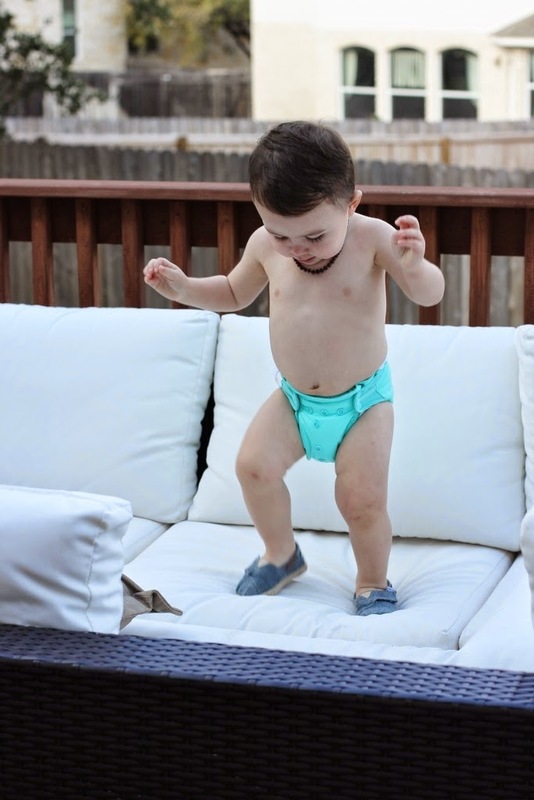 Last summer he basically lived in a diaper and I look forward to my diaper booty boy this summer! There is a video below of him playing, he is a party of one. He is just the sweetest little thing, Ruthie! he is so sweet & that lip of his. Future heart breaker for sure!!! oh my goodness, he is a living doll!! He is SO big! Eep I love him.